Businesses, experts and government representatives from around the world will gather on the nation’s southern resort island of Jeju this week to discuss the future of electric vehicles and seek global partnership for universal standardization. The fifth annual International Electric Vehicle Expo kicks off Wednesday through Sunday at Jeju Convention Center, presenting evolving technologies of green vehicles and new business opportunities for participants, the organizers said Monday. 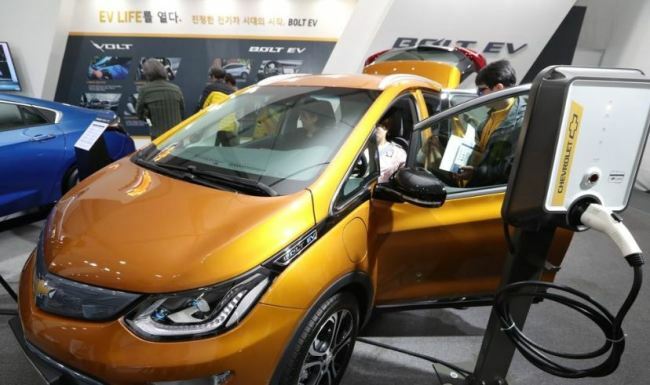 “This year’s expo will focus on electric vehicles going long-range from 150-200 kilometers per charge to 300-400 kilometers,” said Kim Dae-hwan, chairman of the International Electric Vehicle organizing committee, in an interview with The Korea Herald on Monday. German luxury carmaker Mercedes-Benz will be participating in the expo for the first time. It is set to unveil its latest green sport utility vehicle, the New GLC 350 e4MATIC, in Jeju. British carmaker Jaguar will also join the expo this year to introduce its new EV I-Pace, he said. South Korean carmaker Kia Motors will hold the world premiere of an electrified Niro, while presenting a fuel cell version of the compact SUV and the Soul EV. The annual exhibition is the world’s first and only event on pure electric vehicles, their components, technologies and infrastructure. About 150 companies including carmakers and parts makers are expected to participate in the event this year, Kim said. Lotte Rent-a-Car will sign a contract with Hyundai Motor during the event to buy 100 units of the electric version of Kona. More than 100 officials and experts from 30 countries will also gather to share policy work on electric vehicles on the eve of the expo on Tuesday. James Shannon, president of the Geneva-based International Electrotechnical Commission is set to give an opening speech, while Laerke Flader, head of the Danish Electric Car Alliance, and Yossapong Laoonual, president of the Electric Vehicles Association in Thailand, are to offer case studies of each country’s policy work. Separately, a group of leaders from 10 Southeast Asian countries will launch the first ASEAN EV Forum to promote alliance and partnership with South Korean experts on green cars. The annual event also promotes Jeju as an ideal testbed market for electric vehicles. The self-governing province plans to become a carbon-free island by 2030 with vehicles all operated by electric batteries. Jeju has an electric vehicle charging station in every 3.5 square kilometers, with full policy support.